Any honest appraisal of the way modern society enters the second decade of the twenty-first century must indeed be cautious. Certainly brilliance has shown through periodically in the ten thousand years of human civilization, but senseless waste threatens to overshadow the genius. There seems no heed in the harvest of our forests or our seas. Our population grows at the cost of other species. Petroleum production climbs steadily to a peak even as increasing industrial and automobile emissions befoul the air and dangerously alter Earth's exchange of heat with the sun. Whoever's driving this rig is either asleep at the wheel or forgotten it's moving. Stewardship of the biosphere does not need to be such a difficult proposition. With our planet's wide diversity of natural resources, life forms, and climatic conditions, maintaining a veritable paradise on Earth is entirely within the reach of human enterprise and imagination. There are efficient and practical ways of managing natural resources while also keeping the air and water clean. If we can put a man on the moon or drop a remote control lab on the surface of Mars, surely we can nurture the watershed, maintain the ozone layers, conserve the soil, husband the forests, find a clean, efficient energy source, answer poverty, and grant the basics of life to every man, woman, and child. These feats are not outside our abilities or our economics. 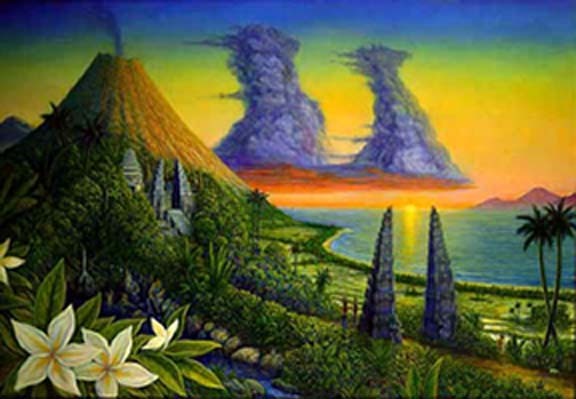 "Morning of the World" by Mark Henson. All rights, US and International, reserved by the artist. And yet, more and more, we are seeing projections for sustained economic recession driven by poor natural resource management and long-term environmental stress. What will climate change eventuate? What happens when the price of gasoline doubles, then doubles again? Can we really pump the world's aquifers dry? The answers to questions like these are difficult without qualification. No one can predict what the next one hundred years will bring, wondrous invention or social collapse. But to deny the implications of global warming or to think business as usual will solve the economics of fossil fuel depletion is foolhardy. Climate Change is a clear and present danger with far worse potentials than any terrorist threat. Energy stresses will only complicate the problem. Still no scenario is predestined. We can control our fate. That is the point of the essays and articles that link from the table of contents below. We must prepare for all probabilities, gather the information, put the pieces together, and find a thoughtful way to guide and nuture a planet containing many billion inhabitants and vast natural resources into the future. In the end, the full potential of human civilization can not be realized until we recognize our place in the entire spectrum of living things. We are not apart, but implicate in the design. We must match our achievements in science and technology with a comensurate humanity. We must express our vast intellectual genius with a grace equal to its imagination. And foremost, we must respect the organic integrity of our planet home. This is our real challenge; understanding that regardless of culture, race, or belief, we are all first earthlings. Clean air, clean water, and diveristy in the community of life are essential to our survival. FOOD: Arable Land, Topsoil, Water, Seeds, Sustainable Farming. The first task in the management of Spaceship Earth is providing a predictable and sustainable food supply for the human population. In the very simplest terms, the primary variables in the food equation are the number people to feed, the amount of arable land, the health of the topsoil, the availability of clean water, and the vitality of the seeds. Read articles. ENERGY: Peak Oil, Alternative Energy Sources, Ethanol, the Politics of Petroleum. We are essentially halfway through Earth's stores of petroleum. The age of cheap oil is drawing to a close. Life beyond oil will be daunting, but one thing is certain, learning conservation will be easier than finding an economic and sustainable replacement for fossil fuel. Read articles. CLIMATE: Global Warming, the Oceans, the Forests, Ice Masses. Climate Change is now recognized as the most serious problem of our time. Disruption of the ocean currents, lost ice mass, thawing permafrost, heedless burning of fossil fuels, all contribute to a network of positive feedback loops hurrying the process of global warming. What lies ahead is difficult to know, but one thing is certain–the window for confronting this situation is rapidly closing. Read articles. ECONOMICS: Sustainability, the Banking System, Transparency, War. We live in the age of money. Money is everything, security, empowerment, comfort, and hope. Unfortunately, our financial system, our method of generating money, is based on an increasing appetite for a finite set of natural resources. Banking practices, extraction industry subsidies, trade conditions, deregulated financial markets, all are geared to capitalist expansion and a culture of excess, the very antithesis of mindful resource management. It's time to reevaluate the mechanisms of capitalism and the dynamics of the global economy through the lens of sustainability. Read articles. COMMUNITY: Biodiversity, Population Management, Relocalization, Consciousness, Distribution of Wealth. We have detailed a vast knowledge of our planet, its biology, its chemistry, its physics. We have studied the climate and measured the changing temperatures of the oceans and the atmosphere. We have traveled to other planets. There are critical facts that we have learned from this accumulated knowledge. We know burning fossil fuels is a dead end. We know we can't contiue to pollute the water and the air. We know war is nothing but death and degradation. But none of this helps us; our knowledge is merely print upon a page, pixels on a screen, if we don't pay heed and learn to live together. Engineering sustainability is the task at hand, but getting along, sharing living spaces, conjoining with all living things, realizing community, that is the first step. Managing natural resources is an easy chore compared to finding the magic glue to keep us together. Read articles. WHEN WE LOOK BACK ON THE LAST HALF CENTURY, one thing is patently clear. Despite increasing evidence and alarm for global warming, despite growing concern for peaking oil production, we have burned more petroleum each ensuing day with no regard for the environmental or economic costs. Another ten years of this would be homicidal. Do the math. If 1.5 trillion barrels of oil remain, how long will it last at the rate we're using it now? Forty years or thereabouts. Even if two trillion barrels of petroluem remain, it's still not enough to get us through this century! And what about the long-term effect of the resultant carbon emissions? Below is the EPA's 100-Year Global Warming Projection. The upper part of the red portion represents temperature increases if we continue to burn oil at our current rate; the lowest part of the red portion represents temperature increases if we had stopped using fossil fuels in 2010. Notice that the temperture continues to increase on this lowest path even though there is no further use of fossil fuel. There is a significant lag-time to climate change. Even after we've stopped burning fossil fuels entirely, the warming trend will continue another fifty to one hundred years.